Our US Marine Corps Flag medal display case is made of finely crafted wood with an elegant walnut finish. This US Marine Corps Flag medal display case is ideal for displaying medals, memorabilia, certificates and a flag. 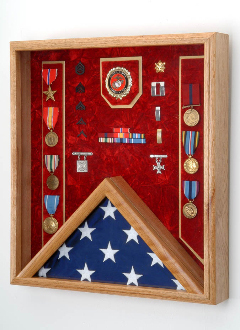 This Flag US Marine Corps Flag medal display case - Shadow Box holds a 3' x 5' folded flag (flag is sold separately). The Medal display area is lined with rich black, Blue, Red, or Green felt. The size of this US Marine Corps Flag medal display case is 18" wide x 20" tall.